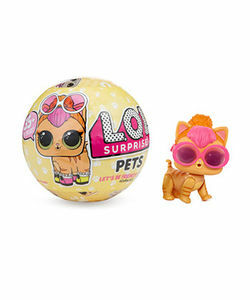 Where can I buy the LOL Surprise Pets in the UK? The Latest Deals Stock Checker will help you find LOL Surprise Pets in stock in the UK. The new LOL Surprise Series 3 includes puppies, kittens, bunnies and the 'ultra-rare' hamsters. Expect a new collecting craze to begin! We'll constantly check for LOL Surprise Pets stock around the clock, and you can sign up for our FREE Email Stock Alerts. LOL Surprise Pets are available today (20th November) at Snyths Toys to pre-order. Expected in stock in December. I have heard its supposed to be the 15th/16th December by someone who works in Smyths but I’ll still keep checking all the sites. I just spotted a LOL Surprise Pets 3 Pack has just been listed by Argos, price £29.99. LIMITED STOCK. These are like Gold Dust! right now in the UK. Please can you add a link to stockchecker.